Tag Archives: bluestone coffee co.
Jerry Seinfeld’s show, Comedians in Cars Getting Coffee, is one of my favorite binge TV addictions. After reading about the You Tube videos, my hands flew to the keyboard and I got hooked after the first episode. I now watch them on the Crackle channel on TV so I can get a dose of happiness in less than 30 minutes. I’m a huge fan of some of the great comedians featured in the show, and have become a fan of many more that were new to me. My friend, Maura, lives in New Jersey. When I realized that an episode featuring Jerry Seinfeld and Stephen Colbert was filmed at a coffee place in Jersey, I knew it was a sign! I immediately contacted Maura and asked if the Bluestone Coffee Co. in Montclair, NJ was close to where she lived…and happily, it was. After some coaxing (ok, begging) she agreed to come with me to the Bluestone Coffee Co. to do a breakfast review. Along with the begging on my part, I also had to practically pinky swear not to talk to everyone we met. This is usually very difficult for me, but those are the sacrifices I make for Somebody’s Mom. We set out in Maura’s 2009 grey blue Chevy Malibu, the interior, unforgettable, because I forgot, the horsepower, I have no idea and really don’t care. Jerry would not be very proud of me, since I lack any and all car knowledge which he always talks about at the beginning of his show. There was metered parking available on the street in front of the Bluestone Coffee Co., and a charming outdoor space dotted with black wrought iron tables and chairs with colorful flower center pieces and sugar sticks adorning each table. I confess I couldn’t resist snagging a couple of sugar sticks in my bag to research on the Internet later, of course, when Maura wasn’t looking. The atmosphere inside and outside was very Bohemian and relaxed. It felt like a favorite neighborhood hangout, very busy for a Thursday morning. Inside were bluestone tiles centered by wooden framed tables, hence the name Bluestone Coffee Co.
Maura felt like an early lunch and I felt like a late breakfast. She ordered the BLT on Texas toast with honey mustard on the side. I ordered the Zucchini Parmesan Frittata served with rosemary potatoes and toast. I chose the challah bread toasted without butter. To my dismay, they had no real butter pats, just the mystery whipped diner concoction – (is it butter, is it margarine? no one knows for sure). 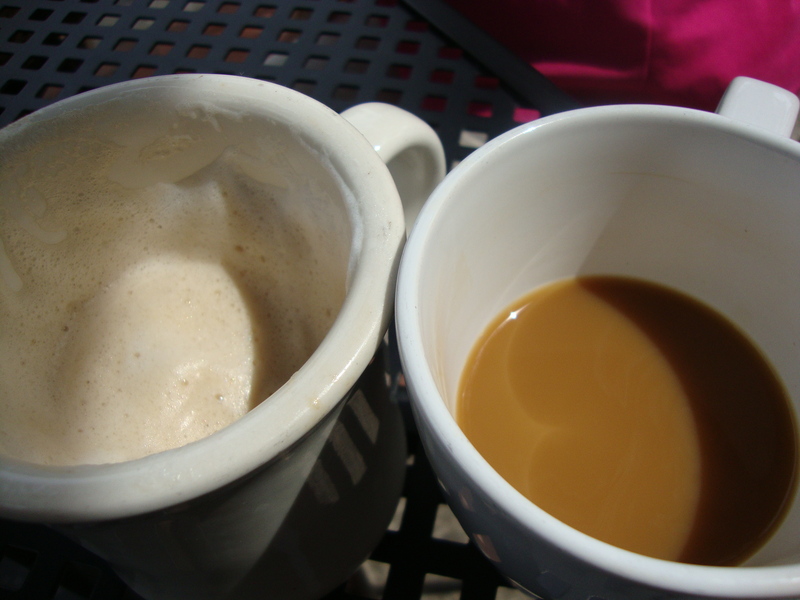 For our coffees, I ordered a delicious decaf cappuccino, and Maura ordered the special coffee for the day, Sumatra, a bold strong brew, but pleasantly pleasing to the palate. The Frittata was very good, but resembled a zucchini omelet with sprinkled parmesan on top. The rosemary red potatoes were more of a dinner potato and not a home fry breakfast potato. Not the way I prepare them at home, but good nonetheless. The bread tasted freshly baked and didn’t need any butter, which worked out for me. Maura’s BLT was superb, and she thought the accompanying honey mustard dressing was homemade with strong notes of both honey and mustard. All in all we had a very enjoyable experience. At $22.89 without a tip, our breakfast was reasonably priced for a specialty breakfast place. The rest room was unisex, never a favorite of mine. It was small and conjured up memories of those turn of the century tenement bathrooms you might see in an old movie, with the plunger right next to me ready for quick use. Happily, I didn’t need to use it on my visit. It was a beautiful day and Maura knew of a cute bookstore close by, so we took a walk around. The bookstore could have been right out of the Meg Ryan and Tom Hanks movie, You Got Mail, bookstore. It really was that adorable, with kids reading books in the children’s section and cute little necklaces and writing pads for sale. Everyone seemed happy who was working there. Cashing out, I had bought Maura a gift of a necklace with a little bird, because she likes birds, and behind me, she cashed out with a gift for me of a writing pad I had admired a few minutes before. It felt like we were on a mini vacation, browsing in the bookstore, walking around town, eating out. We may not be comedians in fancy cars, but we are moms in regular cars getting coffee and laughing at everything and nothing. Not much different than Jerry Seinfeld and Stephen Colbert, except for the fact we are not famous, (yet), if you ask me!